Jarick, John, ed. 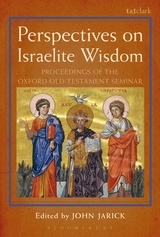 Perspectives on Israelite Wisdom: Proceedings of the Oxford Old Testament Seminar. Library of Hebrew Bible/Old Testament Studies. London: Bloomsbury T&T Clark, 2016, pp 520, $128, hardback. Proceedings of the Oxford Old Testament Seminar focuses on ‘Perspectives on Israelite Wisdom,’ and covers broad issues in the wisdom tradition and corpus. The volume has no overarching thesis, hermeneutic, or methodology, but provides essays from diverse theological perspectives. After an introduction by John Jarick, the book divides into three sections. The first section covers ‘Issues in the Study of Israelite Wisdom.’ Stuart Weeks evaluates the watershed article by W. Zimmerli ‘The Place and Limits of Wisdom’ and finds his conclusions wanting. John Barton writes on four different issues on ethics in the Old Testament but unfortunately covers each briefly with no conclusion or synthesis. Jenni Williams employs Samuel and Proverbs to illustrate women’s relationship to wisdom. Aulikki Nahkola offers a paremiological study of Proverbs to understand the worldview of Israel. Will Kynes ends the first section with a fundamental critique of wisdom literature. The second section covers ‘The Wisdom Corpus of the Hebrew Bible’ with two essays on Proverbs, two on Job, and three on Ecclesiastes. In the first essay on Proverbs, Gary A. Rendsburg connects literary and linguistic issues in the book of Proverbs. The next essay on Proverbs, James E. Patrick defends a connection between Proverbs and Deuteronomy through ‘the fear of the Lord.’ David J. A. Clines pulls imagery from Job to draw a picture of the universe from Job 38 in light of the Ancient Near East cosmology. Terje Stordalen argues a conservative redactor tamed the rebellious Job by inserting material. John Jarick shows Hellenistic influence in the structure of Ecclesiastes. Jennie Grillo examines Jerome and Gregory of Nyssa interpretation and their value for modern study (p. 248). Mette Bundvad concludes with applying a psychoanalytic spatial theory to Qohelet. The final section covers contributions on ‘Other Texts in Relation to Wisdom.’ Susan Gillingham probes the Psalms to see what they tell us about the wisdom tradition. Edmee Kingsmill SLG compares the Song of Songs with wisdom literature to demonstrate its affinity to the wisdom corpus. John Day digs into the Garden of Eden to determine if there is a relationship from the ‘the knowledge of good and evil’ and the ‘tree of life’ to wisdom themes. Phillip Y. Yoo highlights the lack wisdom in the wilderness tradition demonstrates the rebellion of Israel. Katherine J. Dell positions Jeremiah as a renegade sage who uses tropes to oppose the wise (p. 381). The final three essays focus on non-biblical material in Ben Sira and Handel’s Nabal. Deborah W. Rooke compares the biblical account in 1 Samuel 25 against Handel’s Nabal. The next two essays cover Ben Sira, which is a deuterocanonical wisdom book. James K. Aitken and James E. Harding use Ben Sira to argue for Hellenistic influence on the text of Ben Sira. The Oxford Seminar proceedings provide a significant collection of essays to the study of Old Testament wisdom. The essays cover a broad range of issues which enable students the ability to familiarize themselves with wisdom issues. A few essays stand out above the rest. First up, Weeks essay on Zimmerli’s creation theology provides an updated critique to his creation theology. Creation theology proposes justification through the created order (p. 10), which provides an alternative for justification apart from the covenant. Weeks demonstrates Zimmerli’s lack of biblical support, and his root in Lutheran and scholarly context (pp. 10-11). Wisdom literature revolves around the resemblance and difference of wisdom and historical literature. Weeks provides a way forward by stating “the more that we stress the resemblance, the greater that tension becomes.” (7) Tensions must exist within scripture and handled on their own terms. In the third essay, Patrick unites Proverbs with the Deuteronomic revelation at Horeb through the fear of the Lord. His essay readjusts current scholarship from a late deuteronomic date, which disallows contemporaneous usage by Proverbs. He suggests that pre-exilic Israel shows a clear interest in the stories of Israel’s History (p. 166), for the fear of Lord begins at Mount Horeb with the giving of the ten commandments (p. 164). This foundational story lays the structure for Proverbs 1-24. His essay provides a welcome readjustment to Proverbs dependence upon Deuteronomy. He perhaps stretches the imagination at times with calendar dates but provides a thoughtful examination of the material. The fourth essay, Phillip Y. Yoo argues that the wilderness generation perished because a lack of the fear of the Lord (p. 370). Wisdom remains absent from the wilderness generation because they challenge Yahweh’s authority rather than submitting to him in fear (p. 363). Yoo hinders his argument by referring to JEDP but provides overarching implications for interpreting wisdom literature. His solution provides possible answers to the presence and absence of wisdom in other scriptures. These essays weigh in on multiple topics, but some stretch the categories for the ‘Perspectives on Israelite Wisdom.’ Rooke’s essays fails to fit within the category because she provides no insight to the Israelite perspective, but sets her essay in 1700 A.D. The essays on Ben Sira focus on friendship and table manners which are at best sub-themes in the wisdom tradition. These issues mentioned above agree with Kynes’ essay that wisdom literature is an artificial category that often expands to the needs of the community and fails to distinguish unrelated materials. The diversity provides a broad range of essays, but a definition of wisdom literature remains allusive. The Oxford Seminar has compiled a great resource for scholars and students to wade through the issues. The brevity on each topic provides a launching point in each topic so that students and scholars will benefit in their studies. A student new to the study of Old Testament should begin with Kynes’ essay to consider the validity of the genre. Next, one should consider Patrick’s essay for hermeneutical methodology in interpreting Scripture. Scholars will benefit from Dell’s essay on Jeremiah’s use of wisdom as a trope against his opponents. She argues that Jeremiah’s use of wisdom sets the stage for the next transition in Old Testament scholarship (pp. 377-79).